The one legitimately good thing you can say about the Twilight movies is that they were so successful – quality aside, of course – that they allowed the main actors free reign on whatever the hell they wanted to do next. That meant that they could pick the strangest and most out-there projects to work on, and they would still receive attention because of their participation in that popular franchise; this is something that Robert Pattinson has definitely taken into account by signing up for Good Time, which is by far one of the most challenging and ambitious movies someone like him could ever agree to star in, but it works because it’s such a surreal journey that’s hard to not get some enjoyment out of. Pattinson plays Constantine aka Connie, a young man who enlists the help of his mentally-challenged younger brother Nick (played by co-director Ben Safdie) to rob a bank, but when that goes pear-shaped Nick is arrested and taken into custody, while Connie tries to find the money to pay a bail bondsman so he can get him out of prison. This leads Connie on a wild, non-stop odyssey through the seedy underbelly of New York, where he finds himself inadvertently causing more and more problems for himself as the night goes on. There’s something quite electrifying about how brothers Ben and Josh Safdie direct this movie, as though it had been hit with a bolt of lightning and in response had given it enough energy to outrun even The Flash on a Red Bull binge. The moment that Pattinson first shows up in the film, it suddenly begins to power walk its way from one plot point to another, and it’s all done with such neon-drenched style and energetic consistency that you’re not only able to follow it without too much complication, but you’re also totally on board with how it is being filmed and want to see how much crazier it can get. The Safdies seem to have completely nailed the sleazy aesthetic that Scorsese once brought to Taxi Driver, only instead of the ultra-violence they’ve focused more on how deep and disturbing this web of criminality can go, all of it from the perspective of someone who really couldn’t care less about what’s happening around him but is forced to go along with it because he’s landed himself in the situation. That creates some darkly humorous moments that can both horrify and raise an uncomfortable laugh at the same time; to avoid being caught out when his face appears on the news, Connie tries to defuse the situation by making out with the only other person in the scene, who for context is a sixteen-year-old girl. By trying to get rid of one problem, he’s created about a dozen more in one go; and that’s part of the fun of Good Time, that you’re offered a peek into this bleak part of the city but it can become so ridiculous you can’t help but laugh at how you’re seeing things get worse and worse for this guy. Carrying this whole movie on his shoulders, Pattinson gives one of the best performances you will probably ever see him give, as this street-smart guy who is constantly on edge because he’s either screwing up royal or creating tons more problems than he originally started out with, and he really throws himself into the banality of the character as well as the tough environment he has surrounded himself in. It’s also fun to watch him interact with characters who often tend to show up just for the one scene and are then never seen or heard from again, like Jennifer Jason Leigh as his older girlfriend who still tends to act like a sullen teenager around her mother, and Barkhad Abdi as a night security guard who pursues him during his wild night on the town. There are tons of surprises and twists the film throws at you, and Pattinson reacts to the majority of them with a wide-eyed sense of frustration and confusion, as though he – like the audience – is clearly out of his depth with every passing moment yet decides to stick with it anyway, because he’s come this far and he might as well finish it off. It’s a fairly quick sit at just under 100 minutes, but the pacing is so quick that tons of things will happen in the span of seconds and you’ll still have enough time to pick up on all of the pieces. There are times when it can perhaps move a bit too fast, and how everything wraps up is a little rushed, but you’re having such a guilty delight in watching such depravity and on-screen sleaze that it really doesn’t matter in the end, because as the title knowingly suggests, whether you go in with any hint of what happens in it or not, you’re bound to indeed have a good time with this movie. 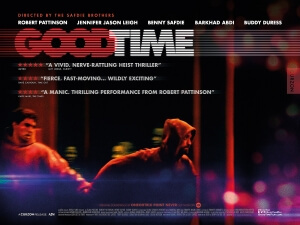 Good Time is a fast-paced and unapologetically sleazy thriller that revels in its neon-drenched style and an electrifying lead performance by Robert Pattinson, which makes it a far more fun watch than it appears to be, and – like the title suggests – leaves you with the feeling that you had a good time while watching it.